Partly cloudy skies. Low 41F. S winds shifting to NNW at 10 to 20 mph.. Partly cloudy skies. Low 41F. S winds shifting to NNW at 10 to 20 mph. 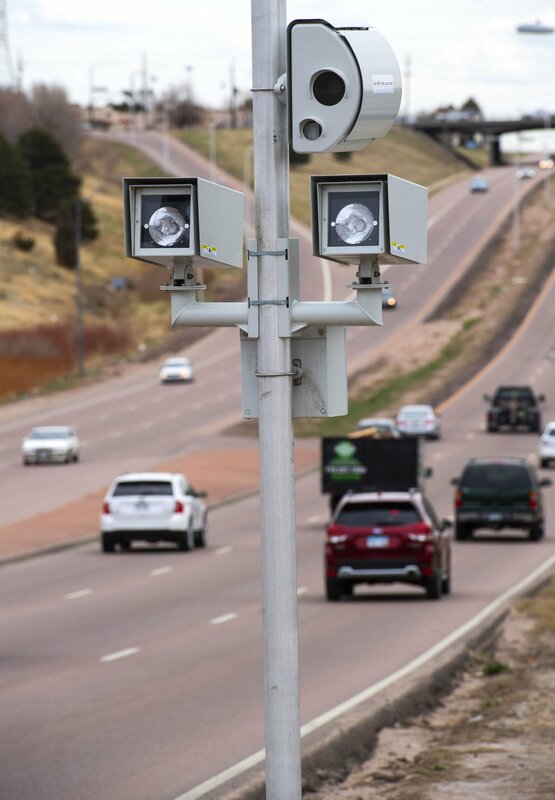 Eastbound traffic on Platte Avenue drives past the newly installed red light camera on Friday at the intersection of Platte Avenue and Chelton Road. David Ramsey (Cams won’t deliver nirvana, April 12) is right on about red light cameras not being your friend even if you never go through red lights. Just wait until you don’t come to a complete stop when turning right at a red light camera intersection. And, be sure to stop behind the crosswalk markings when the light is red. Many flaws in this red light camera system that do not require judgment from a police officer. Now, tell me why there would be a red-light camera at Lexington and Briargate Blvd. This is a small neighborhood intersection. The speed limit is 35 mph and the wait at a red light is very short. There are many large, busy intersections in Colorado Springs and they choose Lexington and Briargate Blvd., to install a red light camera? Crazy. In response to Doug Landolfi’s letter and others of a similar theme: Why not let the government install cameras and similar surveillance devices on your property, and even in your residence for that matter? The only people who should be concerned or upset by that are those who are doing something they shouldn’t be doing. If you don’t do anything wrong, you’ll have no problems. The Gazette published a letter on April 7 by Deane Berson alleging that I cried angry tears in talking about the Palestinians’ right of return. Years ago, I attended several dozen monthly discussions about interfaith matters with Deane and a few others of Bahai, Christian, and Buddhist faiths. I have never been angry or cried in these discussions, as those other participants would verify. I do not think that Deane would deliberately prevaricate, so the only other reason that comes to mind for his false allegation is that there are some serious confusions in his mind, which seems to be borne out by the rest of his letter, complaining about the Rabbi to the public instead of the Board of Directors of Temple Shalom, and his imaginative but irrational Islamophobic fearmongering. I have lectured at Temple Beit Torah, and written several columns in the Gazette, so my position on such matters has been well known for years. Peace in the Holy Lands is possible if wiser heads prevail. The key to true and lasting peace is justice for both Palestinians and Israelis, a justice based on mutual recognition that Jews and Arabs are brothers in Abraham. Ishmael and Isaac stood together at Abraham’s funeral, and Esau married Ishmael’s daughter to please Isaac. The greatest Jewish rabbi post-Diaspora, Moses Maimonides, worked for the Sultan of Egypt and wrote his “Guide for the Perplexed” in Arabic, and hundreds of thousands of Jews lived in Morocco after the Spanish Inquisition till the creation of Israel. Even though bringing about peace in the Holy Lands may be complex and difficult, I strive to be among the peacemakers. On Saturday, April 6, at the Ent Center for the Arts, 80-plus trombone enthusiasts from all over Colorado attended the 2019 Colorado Trombone Festival. This fabulous event, sponsored by the University of Colorado at Colorado Springs Visual and Performing Arts as well as Graner Music, was hosted by Dr. Sondra Bell, a freelance performer, trombone instructor and faculty member at the University of Colorado at Colorado Springs. Invited by Dr. Bell, the festival featured one of Colorado Spring’s own, Marshall Gilkes, a New York-based multistyled virtuoso whose energetic playing and technical brilliance set him apart on the world stage. Active for over 20 years, Gilkes has performed with such jazz greats as Wynton Marsalis, Randy Brecker, Maria Schneider and Ednar Coastaneda. Another invited guest artist, Dr. Nat Wickham, international soloist, recording artist and director of the University of Northern Colorado Trombone Choir was also in the house. Dr. Bell skillfully arranged a series of recitals, practical master classes and clinics. The evening program consisted of performances by the Sliders Trombone Choir directed by Dr. Bell and the UNC Trombone Choir directed by Dr. Wickham. The festival concluded with a mass trombone choir that literally wrapped around the concert attendees enveloping everyone in authentic “surround sound.” Truly the highlight of the day, one might say this performance virtually raised the roof! Speaking for myself and everyone who attended, I am already looking forward to the 2020 Colorado Trombone Festival. When she writes “Social Security is some kind of pension in which you have been investing for years-forget it. Current retirees get their money from payroll taxes paid by those currently working. It’s a government tax-and-spend program,” that is an outright falsehood in a variety of ways. “Projected to collapse,” will still be “79 percent” funded? Does she understand what the definition of “collapse” is?